Published By – Blizzard Music Ltd.
1-1 to 2-7 Recorded live December 5, 1997 at the N.E.C. in Birmingham, England. Remote recording by Manor Mobiles. Mixed at Rock Field Studios, Wales, U.K. Additional mixing at A&M Studios, Los Angeles. Digital editing at A&M Studios. Mastered at A&M Mastering. 2-8 and 2-9 are new studio tracks. Recorded April/May 1998 at A&M Studios, Los Angeles, CA. The 1st catalogue number appears on the back insert while the 2nd appears on the spine. "2CDs Specially Priced / 01-491954-11" sticker on variant 11. © 1998 Sony Music Entertainment Inc./℗ 1998 Sony Music Entertainment Inc.
Singer Ozzy Osbourne left Black Sabbath in 1979 to devote himself to his solo career. The influential hard rock band band then underwent numerous changes (Ronnie James Dio, Ian Gillan, Cozy Powell) to the almost impossible happened in 1997. In the original line-up (Ozzy Osbourne, Tony Iommi, Terry ' Geezer ' Butler and Bill Ward) gave the band two gigs on 4 and 5 december in Birmingham, England. 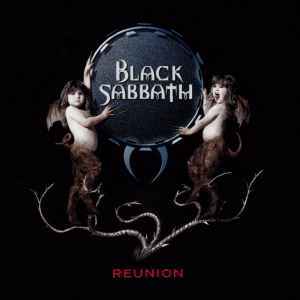 The double cd is a recording of the second Reunion concert and includes classics like War Pigs, Sweet Leaf, Sabbath Bloody Sabbath, Children Of The Grave and Paranoid. The band recorded two new songs in the studio: Psycho Man and Selling My Soul.